Have you ever been told that you made someone’s day? Has someone ever made your day? Have you experienced that feeling where you feel like people care and want to be there? This feeling, is one I want everyone to experience. It’s one of my new goals to make someone’s day. Whether it be complimenting them, letting them know I love them, or simply being nice to them. Kindness makes the world go round. It is something this world needs more of. If everyone were to participate in ARK (Acts of Random Kindness), people would most likely feel better about themselves. The best feeling is when someone shows their affection, care, support to you. When someone tells me “I love you, and you have a purpose here, you are going to do great things!”, my day feels so much better. It is so great to know that someone cares for me and wants me to be happy. It’s almost as if I feel “lighter” or “high-spirited”. The confirmation of the things you’ve always wondering, like “Am I even loved?”, “What’s worth fighting for anymore?”, “Do I even belong?”, makes you want to go even farther in life. So join me and make is a goal to participate in ARK everyday. Who knows what will happen when you make someone’s day. You just might be the person who changes their life. If you know what it feels like, pass the feeling on! There is always one thing you can be sure of when you leave camp: You will have a spiritual high. It’s so amazing what God can do in just a week. But when the Holy Spirit enters you at camp, you always still feel great for a week or two afterwords. Our speaker this year, Doug, was trying to convey to us that our spiritual high doesn’t have to stop. We should have the same passion for God now to when we go to Ignite Camp 2014. The biggest thing that stuck out to me in all of his messages was what we need to actively be doing. He gave us four “30-day challenges”. If we actively do all of these things, people will start to see something different in us and will want to know what it is. And in the end, it all leads back to God. Awesome right?! I think I might just go out and buy someone’s groceries or help out at retirement centers. I want people to see God in everything I do. One of the biggest life changing events that happened for me at Camp was getting baptized. On the first night, I felt like God was calling me to get baptized. I realized that the Thursday of the week we were at camp–July 11–marked the 3 years of when I accepted the Lord into my heart. I felt even more of a calling to get baptized on that day. When I did get baptized, I felt like all the baggage in my life was taken away and I felt so much “lighter”. It’s an unfathomable feeling, but if you’ve been baptized, I think you know what I’m talking about. From that day on, I have felt the Holy Spirit take over my life, and direct me in the way I should go. It is surely a day I will never forget; Praise God! There sure was a lot of crying at camp. On the last night, we partake in communion. We pray with our cabins, and it’s just a huge night of self-reflection and community. At one point, my whole cabin and I are all full on sobbing. Don’t forget the fact that just 3 hours earlier I had been baptized, so I was already emotional. At one point I couldn’t control myself anymore! I went from hyper-ventilating to not breathing at all. Geez, what a night that was! But God definitely moved in everyone, and in the midst of the tears, he changed me. In the end, Ignite Camp is definitely worth taking up a week of your time to do. Through all the tears, laughing, 4-square tournaments, kayaking on the lake, amazing worship and more, you couldn’t ask for anything else. God does marvelous things at Ignite and I am already counting down until next year! Ignite Camp was so life changing for me. Through all the Worship and getting to see God move, I couldn’t have asked for a better way to spend a week in my summer! I got baptized in front of my “family” and the Holy Spirit worked through me in miraculous ways. Take a look at a few glimpses of camp! And stay tuned for a post about my experiences at camp! As I had mentioned in one of my previous posts about “love at first sight”, I thought I would expand my opinion. You see, in high school, you are forced to read Romeo & Juliet as a required book. Throughout the whole book, we keep seeing the rebellious, desperate love between Romeo Montague and Juliet Capulet. Having just finished the book, and creating a project on it, I realized how much I hate their love. It isn’t hatred out of envy. I hate it because it is so unrealistic. “Love at first sight” is one of the most cliche sayings I have ever heard. If anyone, in their right mind, can say after seeing a person for the first time, knows for sure they will marry that person, then something is wrong with them. Think about the last time you met someone for the first time. Did you act the same way you would have if you had known them for years? The answer is most likely no. In the first 30 seconds that a person sees you for the first time, they have already made a lasting first impression. It will, theoretically, take another 3 hours with that person until they can see your true self. So to hear that in the 30 seconds that you know someone, you already knew you wanted to marry them, is just unrealistic. The person you talked to then, is not the person you will talk to in a week. To back this statement up, just look at the book Romeo & Juliet, when Romeo kills Tybalt, all Juliet can say is, “It is a serpent heart hid by a flowering face”. She saw his evil, and quick frankly, “true” side. So “love at first sight”, is not a realistic view in life. It is something Disney movies have brought up into our lives. If you go back now and rewatch the classics like, Cinderella, Sleeping Beauty, etc. As you watch them, being older, you realize how unrealistic the love in the movies are. So get out of Disney love, is isn’t real, and neither is “Love at first sight”. It’s finally here! My 15th birthday! It is weird to think that 15 years ago today, I was born. Time flies when you are having fun! I was born May 4, 1998 at 2:31am. I feel bad for my Mother, I wouldn’t want to be up that early (or late) having a child! But something made my birthday already, and it is only 11:45!!! At 2 am last night, I got a “Happy Birthday” tweet from an actor!! Dule Hill, or as most people know him. “Burton Guster/Gus” from Psych gave me a birthday reply at 2am!! His birthday is May 3rd, and obviously mine is May 4th. We are almost birthday buddies! I did it as a joke, I didn’t think he would see the tweet, yet alone ACTUALLY reply back!! 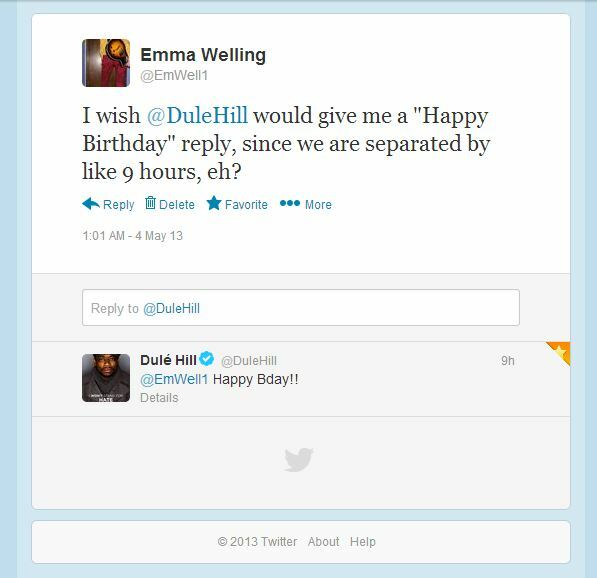 My 15th birthday was made, and I will forever have mad respect and love for Dule Hill. (Not that I didn’t before!). Today, looks like a good line up of things are going to happen! I am going to see Iron Man 3, have the birthday cake of my choice, Torta de Tres Leches, and go to a restaurant of my choice, which I picked a local place this year! Hopefully I can get posting more things soon! School is in its last legs right now, a month left! Your Adventures Await…Go Forth And Conquer! !